As briefly mentioned in my last post, recently I spent a few days hurrying around the house replacing most of Charlotte’s strewn toys with pretty décor accents instead to shoot some of my rooms for inclusion in an upcoming blogger design book! I loved having the excuse to dress-up the house with, what is now, the otherwise completely impractical placement and use of accessories; for obvious reasons, clusters of delicate real roses and stacks of fragile vintage books not being my usual choice for the current adornment of any low-lying surfaces! Though, that said, they did manage to stay rather safely in place for a good few days. Along with styling the spaces, I also updated a few of the more permanent features. In my living room I’ve added a new throw, some new scatter cushions and a new ceramic drum stool. I made the cushion covers myself. The long bold striped one is a repurposed $5 IKEA door mat (I bought the mat about a year ago and think they are now discontinued). Being a door mat, it is quite heavily woven so has a lovely knobby texture and visibly dense appearance though it is still surprisingly soft. The cable knit throw was found on sale at Spotlight for $25. If you follow me on Facebook or Twitter you may have seen back in August that I mentioned picking-up some new ceramic drum stools from eBay. They were around $40 each (a great price for here in Oz where they usually retail for well over $100) though were only available in red or black – not my colours of choice. Though, being such a bargain, rather than pass them up based on colour alone, I opted to buy black stools (one for me and one for Mum) and have a go at re-finishing one in my own custom shade. I was super pleased with how it turned out and now, around a month on, even with Charlotte’s ‘road-testing’, it still looks great and has absolutely no signs of chips or wear. I’ll post the tutorial shortly! I hope everyone’s enjoying a happy, albeit hectic, Christmas lead up! Sorry for my absence of seasonal related posts. To be honest, although I love Christmas time, donning the synthetic tree with pretty fairy lights is, for the moment, about as Christmasy as it gets around here décor wise. I’m sure once Charlotte, and the ‘soon-to-be’, are a little older there’ll be plenty of seasonal crafting and decorating going on. 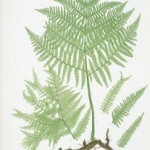 Fern Study Prints with Free Printables! I’ve just been scrolling back and forth and back and forth drooling over these photos. I want to move in to your living room right away if that’s okay with you! It’s just gorgeous. Looking forward to the post about how you painted the ceramic drum. We’re lucky in that we have a big floor to (almost) ceiling french bay window which lets a lot of natural light in. Also, our sofas are quite compact in scale so they aren’t overly dominant. 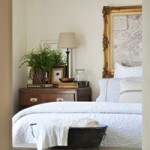 To keep things feeling fresh I like a neutral backdrop and lots of white, cream and grey accents. Some greenery is also a must for me. I think it also helps to minimize clutter. Your room looks beautiful. I love the way you displayed your artwork above the sofa, looks perfect! 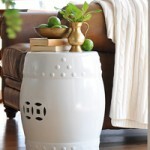 I have a similar ceramic drum that I purchased for double the amount you paid and I thought It was a steal! I have to check out ebay… Have a great day! I’m with Megan up there – we have brown couches as well and I struggle with getting my living room to look light and airy too! 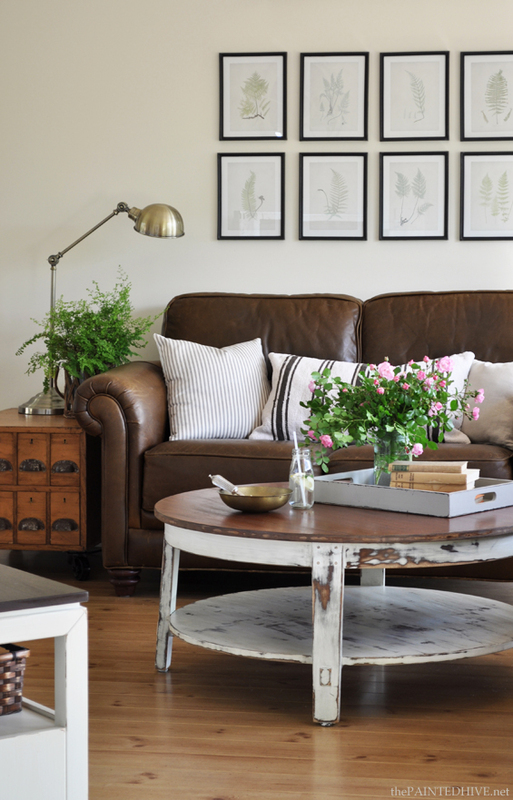 Your living room is such a great inspiration! Thank you for sharing! Hi, your living room looks so wonderful, and so welcoming, love all the neutrals with warm tones. Kristine, your living room is just beautiful :-) It has so much warmth and character, and manages to be elegant and pretty at the same time :-) I love your coffee table & art wall. I have the same drum stool in orange – yours looks like it came in white, the finish looks so smooth & glossy! I bought the card catalogue from eBay. Someone was using it to store bits and pieces in their shed! I just added some caster wheels to boost the height and give the appearance of legs. the photo shoot looks fabulous! how you did it with a wee one is tow is incredible. i must thank you for the ikea rug turned cushion idea! i bought the same rug as i loved the texture but with (at the time) a puppy and one that sheds it wasn’t going on the floor anytime soon. now i can enjoy the “rug” as a cover instead! I love it Kristine! It looks like something you’d see on the cover of a magazine. One that would catch my eye and I’d buy for inspiration. Speaking of inspiration, as soon as I saw the first picture I ran up the stairs and into the attic to get an old lamp I picked up at a second hand store about a year ago and stuck up there till I could figure out what color to paint it and where to put it. It is an ugly 60’s? brownish copperry color and is the type that has a long light hood area (about 18″), takes 2 flourescent bulbs and mounts on the side of a table with wing nuts. I love your handmade cushion covers especially the one that was originally a door mat, your file cabinet/chest, the basket the fern is in… well, all of it and the toys you removed just make it home. :) Thanks for all your inspiration. Merry Christmas! That light sounds really cool! Let me know what you end up doing with it. Thanks so much Jamie. I know many people see leather couches as a practical compromise (which they usually are) though if incorporated thoughtfully I think they can really make a room shine. Discovered your blog through a link party, and I love your style! Your LR looks so pretty and fresh, and it is such an inspiration since we have the same sofa and I’m struggling with decorating around it. Everything is just perfect. Your blog is one of my favorites!! 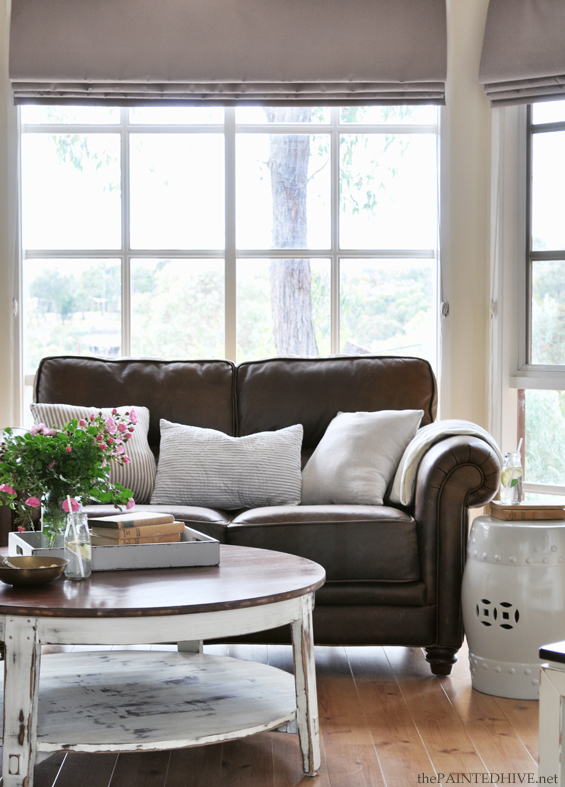 I love the simple, clean and bright look of your living room. It looks so all put together!! Congratulations! 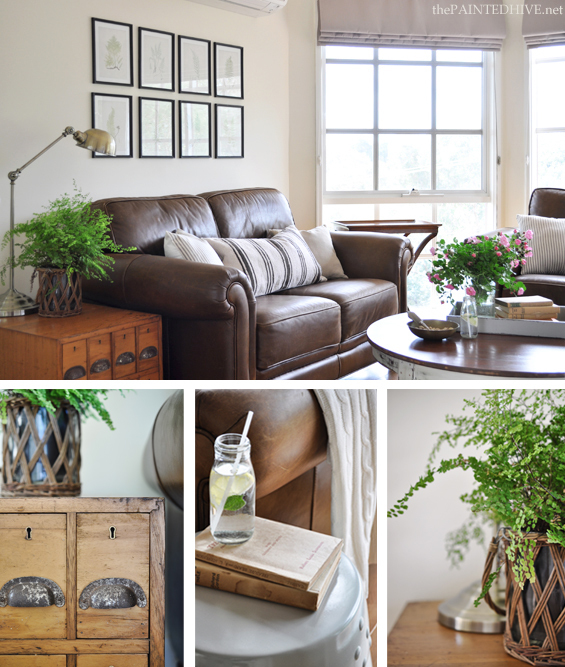 Your home is simply gorgeous and a great inspiration. I found you through Pinterest. Beautiful living room! Would you mind sharing where you bought your couch? Or at least what brand it is? Thanks for your comment. I’m not certain where you live though I’m based in Australia and my couches are from a store called Plush. They were floor stock so I got them at half price. It is the perfect blend of light and dark finishes. Those little pops of sea green in the photos add just the right touch. Well done! Love your room. What is the name of your wall color? It’s a Dulux colour called Chalk USA. Hi Kristine, it all looks beautiful! I just wanted to let you/your readers know that I bought that same rug on Saturday at Ikea Tempe. I got navy but they also had black, green and I think red ones. They are awesome and so cheap! I haven’t been to IKEA for months and couldn’t find the rug/doormat on their website so assumed they no longer sold them. I might need to go and get some more! I love the room. I have been looking for a coffee table just like that, can you tell me where you found it. I love your living room! I especially like that you don’t have an area rug. I wondered how you decided on that? We have hardwood floors as well & my husband & I can never decide. Your room without a rug gives me inspiration that it can still look just beautiful without a rug. Plus with little, it makes life a bit easier when spills happen. Our living room is irregularly shaped (you can see a floor plan here) so a rectangular or square rug wouldn’t work particularly well and I’m not a big fan of round rugs (though I have considered making a DIY faux hide version that I could clean in the washing machine – maybe one day). The room does work without a rug which I mainly attribute to the fact it’s quite small and cozy – there is no real need for a rug to help ‘anchor’ any furniture, define the space or create additional warmth. With a young family I do also love the fact that I don’t have to worry about spills (which happen often at the moment!). Thank you so much for sharing your lovely space! You have SO inspired me. My husband and I are in the process of searching for a new sofa (getting rid of the white slip covered sofa we have now). We want leather but didn’t want to loose the “cottage feel”. You’ve done a beautiful job in accomplishing that. I just need to find the right style here in Arizona or online if need be. I LOVE your sofas. Where did you get them? Thanks! They are discontinued now. I’m not sure where you’re based though I originally bought them from a store in Australia called Plush. I got the floor models so they were really cheap. Have you shared your choice of wall color? 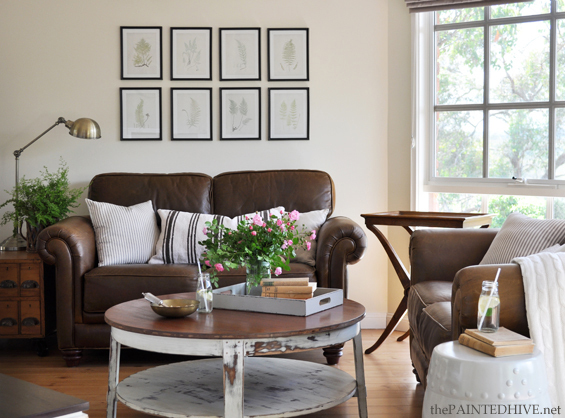 I have a dark brown leather couch and have been looking for the perfect wall color to complement it. I think your wall color may be perfect! My walls are in a Dulux colour called “Chalk USA”. It’s a warm cream. I think any white/cream with a warm base goes well with brown leather. Would love to know what brand your sofa is. 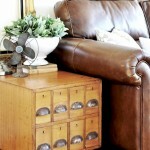 Looking for a leather sofa and came across yours on Pinterest. Thanks! I’m pretty certain they are discontinued now. I’m not sure where you’re based though I originally bought them from a store in Australia called Plush. I got the floor models so they were really cheap. 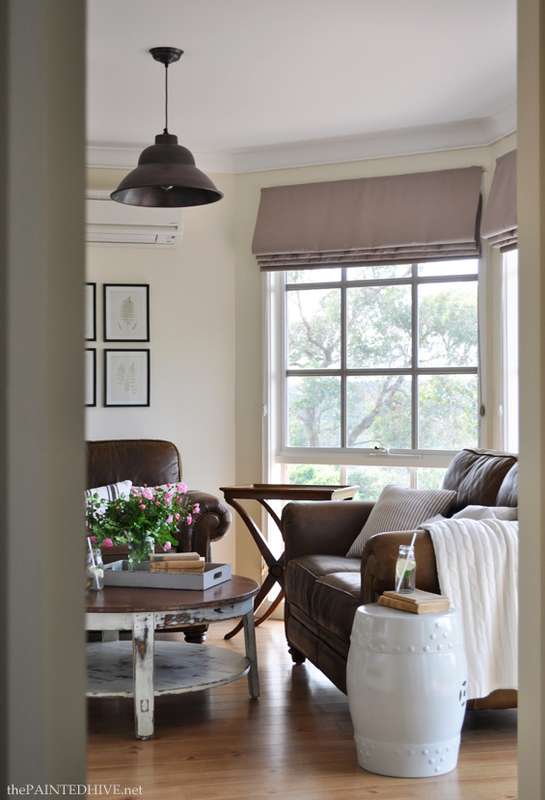 Where did you purchase your lamps you have in the front room…I like them very much…love your design..I also have brown leather sofa and love seat in my front room and am continually fighting with it to make the room lighter and more inviting..where could I get some of those ticking pillows for the sofa? Thanks! I got the lamps through a friend at wholesale price though I can’t remember where from sorry. It was a few years ago now though so I doubt they are still available. I made all of the cushion covers myself so unfortunately I can’t help there either. We’re really lucky to have loads of lovely natural light thanks to the large bay window in our living room. If you’re wanting to keep your room feeling bright opt for light tones wherever possible though try to incorporate some other timber or dark elements for balance, contrast and continuity. Also, try including some plants or foliage to add freshness and vibrancy. Beautiful interior decoration and interior furnishing! Lovely. Do you remember where you got the black striped pillow on the sofa? As mentioned briefly in the article, it’s actually a small IKEA rug which I sewed into a cushion cover. I don’t think IKEA still sells them though (the stripes are actually a dark chocolate brown colour). Here are some similar ones: http://www.ikea.com/us/en/catalog/products/90267066/. Where did you get that wonderful lamp you have in your front room.. I have been trying to find one like that but having trouble finding one…love your room..
Where did you find that wonderful lamp that is in your front room shots?..I am trying to find one for my front room …thanks so much!! love your style and décor. I bought that lamp (actually, I bought two!) about five years ago through a friend at wholesale price. I’m not certain where they are available nowadays though similar ones are reasonably common – that said, they are not always particularly cheap. Try doing a Google search for “brass task lamp” or “brass adjustable arm lamp” or “brass desk lamp” (or similar). nice shooting its lovely and attractive . 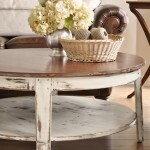 Love it, particularly the shabby chic coffee table! Hello! May I ask what color your walls are painted? I am hopeless at picking out paint! I have brown couches and a lavander accent wall the previous homeowner choose that I never painted over because I can’t pick out a color to save my life. little hive on a BUDGET. as I share projects, ideas and inspiration. Get my posts delivered straight to your inbox. Let me know you were here. Leave an entry in my Guest Book. Take a virtual wander through my easy to navigate thumbnail gallery archives. Unless otherwise indicated, I am the sole owner of all material contained within this blog. Unauthorised republication is a violation of copyright law. One image per article and minor excerpts of written content may be used conditioning that full and clear credit is provided with specific direction to the original content. The use of complete articles, summarised tutorials and multiple images is strictly prohibited. Free printables offered are for personal use only. This blog is committed to exceptional levels of integrity. Any compensated activity will always be carefully considered, clearly disclosed and will never adversely affect the content of this blog. View all my blog policies in full here.